TwoMaids Blog: Two Maids & A Mop Named "Maid Service Of The Year!" Two Maids & A Mop Named "Maid Service Of The Year!" 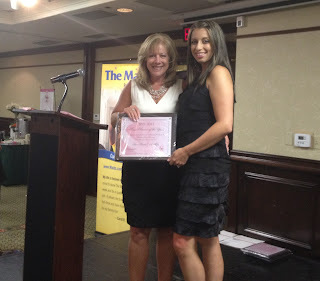 Debbie Sardone (left) presents Liz Hayes (right) with the award!! Two Maids & A Mop is proud to announce that we have been selected as the 2012 Maid Service Of The Year by the Cleaning For A Reason foundation!!! We joined this wonderful organization about seven years ago. We've watched it grow from just a handful of cleaning companies to more than 1,000 across the globe today. In fact, the organization has provided more than 9,000 free cleanings to women battling cancer since its inception. Debbie Sardone is the founder of this charity and she's the primary reason for its amazing journey from just a few free services to nearly 10,000 free services!! The awards banquet was held this past weekend in Dallas, TX and I wasn't able to attend unfortunately. So one of our awesome managers hopped on a plane to accept the award for the entire company. Check out the picture above to see our Huntsville, AL manager (Liz Hayes) accepting the big award!!!! Thank you Cleaning For A Reason for selecting Two Maids & A Mop as this year's Maid Service Of The Year!!! !